The Chairman, United Bank for Africa Plc, Mr. Tony Elumelu, says development in financial technology is fast changing the game in the financial services industry in terms of lowering operating costs and enhancing broader customer reach. 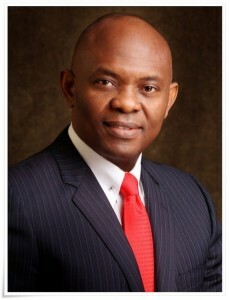 Elumelu, who made this observation at the bank’s Annual General Meeting held in Lagos, pointed out that the development was becoming a major factor in the banking sector. Looking into the future, he said UBA was a part of the leading technology change agents, and thus well positioned to benefit from the opportunities offered by advancements in technology. He stressed that leading in new technology and innovation was part of the UBA Group’s strategy. Elumelu told shareholders at the meeting that the lender’s performance in 2015 reflected efficiency’s gains, prudence and best practice in risk management. “We recorded N315bn in gross earnings, a 10 per cent growth when compared to 2014 earnings. This was achieved in spite of relatively weak liquidity in the Nigerian foreign exchange market, which reduced foreign currency related business and income lines. Our Bank offset the macroeconomic challenges with improved customer service and balance sheet efficiency,” he said. Shareholders of the bank, in turn, applauded the bank for its financial performance in 2015 despite the difficult operating environment globally. They also approved the board’s recommendation to pay a final dividend of 40 kobo per share. UBA had earlier paid an interim dividend of 20 kobo in September 2015 bringing the total dividend paid in respect of its 2015 financial year to 60 kobo per share. Speaking on behalf of shareholders, the President, Independent Shareholders Association of Nigerian, Sir Sunny Nwosu, expressed his appreciation to the bank’s board and management for growing profit and increasing dividend payment at a time when many other banks recorded lower profit and, as such, had to cut dividends. Also speaking at the AGM, the Group Managing Director and Chief Executive Officer, UBA Plc, Mr. Phillips Oduoza, explained that management had eliminated overlapping functions and structures. According to him, the lender has leveraged technology in its operations, particularly in servicing its over eight million customers through low-cost service channels, which ensured it delivered improved performance to shareholders. Speaking on the bank’s operations in Africa, Uzoka assured shareholders that the lender’s African subsidiaries were growing stronger and the group has a target to increase Africa’s contribution to the group’s profit to over 25 per cent in 2016 from 24 per cent in 2015. This, he said, would be achieved without undermining the positive outlook on Nigeria, where the lender expects to see positive growth from imminent implementation of the 2016 budget. According to Uzoka, the bank’s market share is increasing in most of its target markets, as it grows loans and deposits in double digits across most of its operations in Africa.